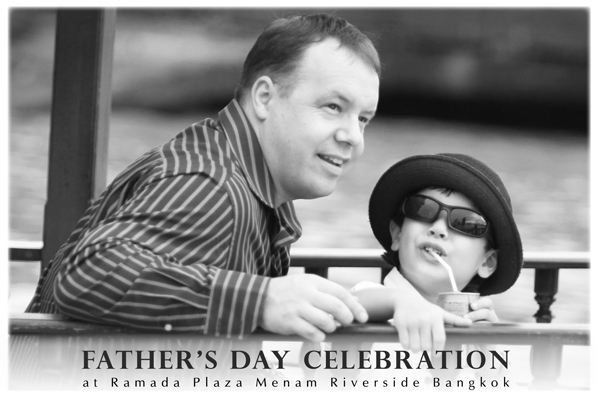 Enjoy BBQ seafood and international buffet dinner on the special occasion “Father’s Day” at Ramada Plaza Menam Riverside Bangkok from 6.00 pm. - 10.00 pm., at Baht 1,200++ for adult and Baht 600++ for children (5 – 12 years old). For every table of 3 paying adults, father dines free with a complimentary glass of sparkling wine, plus 1pound of cake to be decorated by children for their dad with nice corner for taking family pictures as souvenirs and 25% discount for all kind of sweets at the Dessert Dreams Bakery. For more information or reservation, please call 02 – 688 - 1000 ext. 118.